Join the team of America's Warriors Care Package Projects © as we raise money to send care packages to our deployed military. The drawing is for this gorgeous handmade Americana quilt which was made with love in support of our American troops on deployment. Tickets are $5 for a single ticket or 3 tickets for $10. The winning ticket will be drawn on Veteran's Day, November 11, 2019. 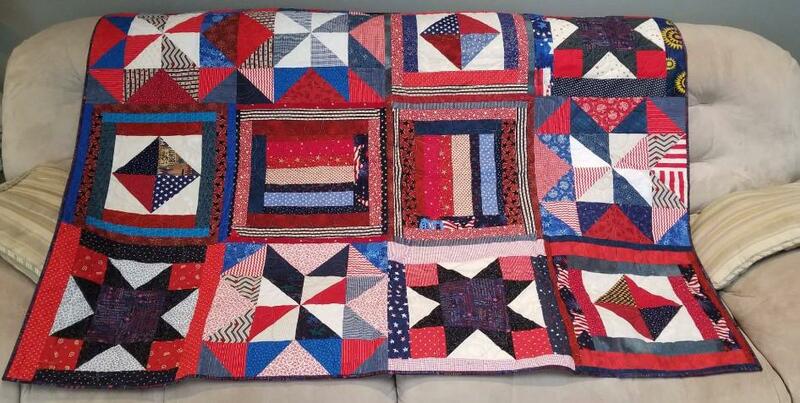 This beautiful quilt measures 5'2" by 3'10". No need to mail ticket or stub to me. Add my ticket to drawing. Please mail stub only to me. Add my ticket to drawing. Please mail ticket and stub to me. I will complete & return.